Eastern music is something quite different from what the west has to offer. With the constant exposure to each other’s cultures, however, the juxtaposition of musical elements is inevitable. Still, it is inevitable that indigenous music remain the same. The truth is that enka is used to refer to two kinds of music. The first one hails from way back in the Meiji and Taisho period when speeches were made into music. The idea was to avoid the disapproval of the government towards political speeches by masking the words in music. The second genre refers to music that emerged after the war, during the Showa period. 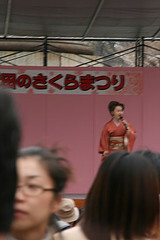 This type of enka is quite popular and has been compared to American country music (not because of the musical style but because of the theme and audience). Enka is usually singing sad aspects of life, irrecoverable destiny, desertion by the lover. It is an expression of love, but love will never be successful and sorrow and tear follow happy memories. It can also be a song of a woman who is resentful to her destiny as her lover is gone to another woman. Anyhow Enka is song of resignation. Resignation must be sweet so that it is endurable. Indeed, with that definition, it makes you think of country songs. Want to hear some enka? Visit Barbara’s Enka Site. I learned a lot from it.